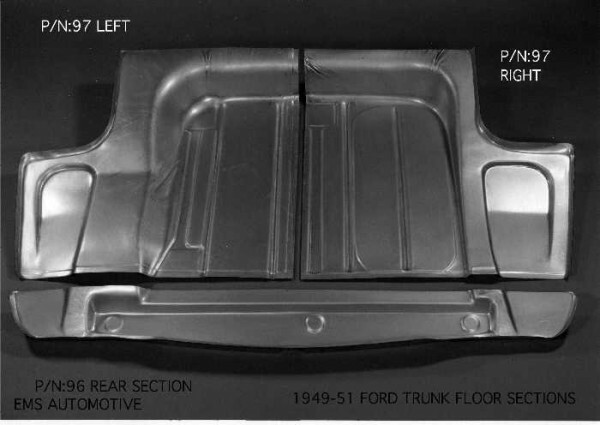 Applications: 1949-51 2/4 SEDAN, COUPE, CONVERT. THE REAR SECTION OF THE TRUNK FLOOR REPAIRS THE REAR MOST SECTION OF THE TRUNK. STARTS FROM UNDER THE TRUNK PANEL. GOES FORWARD 8” AND EXTENDS FROM FENDER TO FENDER. DIE STAMPED WITH ALL THE FACTORY SHAPES AND CURVES. REPAIRS A COMMONLY RUSTED AREA. ASSOC PART: #97 TRUNK FLOOR MAIN SECTION.